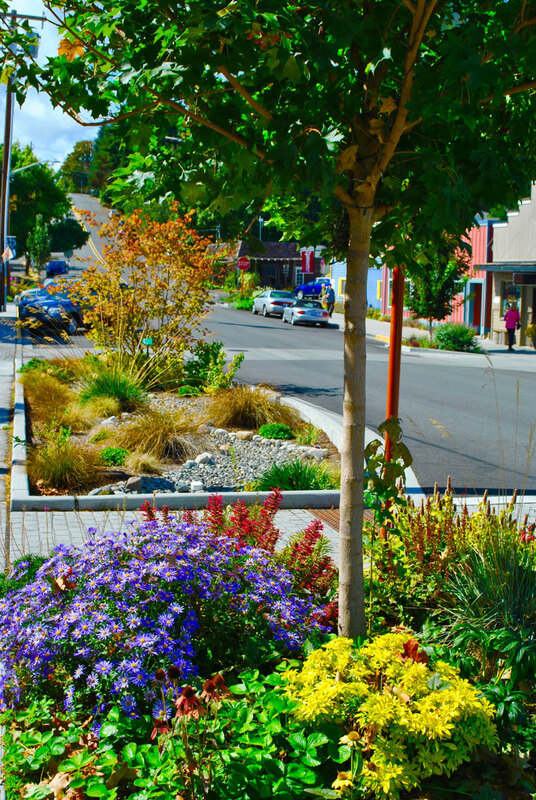 A 2014 remodel of Second Street, a key corridor in downtown Langley, included the installation of the city’s first rain garden. The Langley Main Street Association designed and planted all of the bump-out features of the new streetscape, except the 600’ rain garden, which was designed and planted by a contractor due to the technical requirements. Rain gardens work like a native forest by capturing and infiltrating polluted runoff from rooftops, driveways, and other hard surfaces. Rain gardens can help reduce water pollution and prevent flooding in the Puget Sound. After a year, it became evident that the Second Street rain garden had failed. The plants became too big, wilted and folded over under their own weight making the area look like an out-of-control lawn. Water from the street ran along the curb and exited without circulating through the garden. The city approved the redesign plan by the Main Street Association and agreed to cover the new plant costs. The Green Community award is designed to recognize projects and activities focused on improving quality of life, cleanliness, safety and the environment within the downtown district. Particularly projects that have focused on sustainability, recycling, and the increased quality of life of residents and users of downtown. 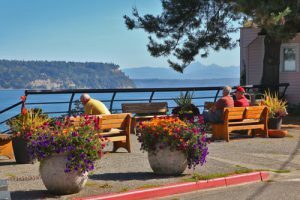 A new plan was designed by Main Street Association intern Emily Martin, a horticulture graduate from the University of Oregon. A rocky channel for better water flow was created to meander through the middle of the garden to guide the water throughout the bed. New plants were added with a greater variety of size, color and fragrance. With record rainfall this winter, the rain garden was put to the test and passed with flying colors – water channels throughout the garden area now and filters through the direct and sand with no flooding occurring. Residents and merchants are happy with the new design, which adds interesting character, plants, and better functionality. The Langley Main Street Association plans to make the rain garden a center piece educational tool explaining the importance of the rain garden in filtering street runoff such as heavy metals, gas and oil, before it enters the sound. This will be a pilot project to encourage and educate building owners on storm water run-off and ways to filter and clean water before it enters the storm system and the sea.